My usual mentality when making curry is the hotter the better but this curry lies at the other end of the spectrum in being mild, smoky and slightly sweet. Murgh Makhani translated to Butter Chicken, it doesn't take much thought to what the main ingredients are but if you have the time (about 2hrs 10mins) and a bit of patience it is well worth the effort. The first step is to marinade the chicken in order for it take on a fantastic yellow colour from the tumeric as well as absorbing the flavour from the garam masala. Some recipes call for the chicken to be marinaded overnight in the likes of buttermilk but I find this extra effort is outweighed by the outcome. Since the chicken will be both grilled on the BBQ and then braised in the sauce the texture will be extremely tender as well as having that smokiness that can only be achieved from flame grilling. Simply cut the chicken breasts into large chunks and mix well with the marinade ingredients then set aside while you prepare the sauce. I have spoken previously about the importance of building layers of flavour when making a curry and like many other currys it starts with onions. 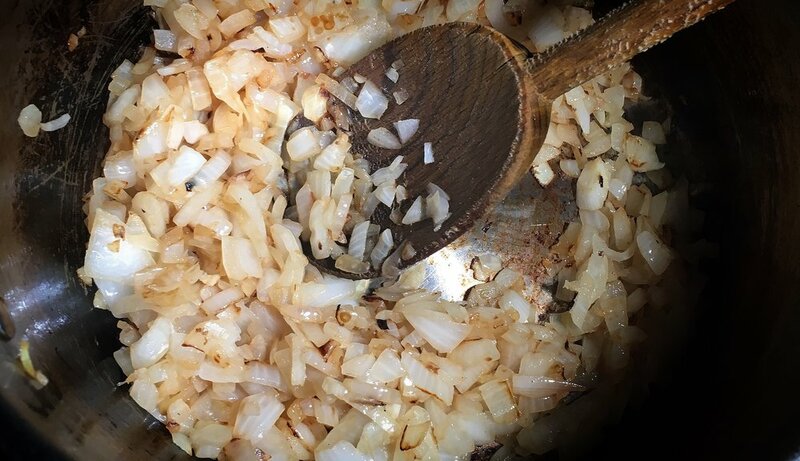 As this will be a mild, sweeter curry it is important to cook the onions long and slow to release maximum sweetness so chop finely and add to a saucepan with 25g of butter. For this dish I used smoked Abernethy butter which as the name suggests obviously adds a smokiness to the first part of the dish. Cook the onions on low heat for 15 minutes stirring occasionally so they don't catch and burn. After 15 minutes add the garlic and ginger and fry for a further 2 minutes before adding the spice mix along with another knob of butter. Ensure the heat is still on low while you mix the spices and onion together. You want the spices to fry long enough to release their aroma but not so long as they burn and ruin the dish, this should only take around 2 minutes. Finish this stage of the sauce by adding the tomato purée and mixing well. With the first layer of flavour complete it's now time to add the liquid ingredients. Add the coconut milk and passata along with some chopped coriander and a couple of bay leaves. Simmer the sauce for 15 minutes to allow the flavours to develop. After 15 minutes add half the double cream (125ml) and continue to simmer for another 20 minutes while you prepare the chicken. To BBQ the chicken ensure your grill is at maximum temperature and cook for 10 minutes. You are aiming for black grill marks on the chicken which will provide a tandoori flavour to the dish. Since the chicken will continue to cook in the sauce it doesn't matter if it isn't cooked through. Remove from the grill and add straight to the sauce. After adding the chicken let the sauce simmer on the lowest heat for a further hour. This may seem like a long time but I think it is necessary in order for the chicken to tenderize, the sauce to reduce and for all the different elements of the dish to come together. After the hour is up its time to add the final layer of flavour, butter and cream. Therefore add another 25g of butter along with the second half of the cream (125ml). Stir for one minute until the butter has melted and you are left with a luxuriously thick sauce. I served with basmati rice, poppadoms and a fresh sprinkling of coriander.